I'm super excited to be participating in day one of Altenew's 4th Anniversary Blog Hop thanks for inviting me Altenew! After your stop at Yoonsun Hur's post, its now my turn to give you some Altenew inspiration. To create my layout today I used the Our Family Scrapbook Kit by Altenew. I chose to document these photos of my daughter blowing out a dandelion on a recent family getaway last summer. I love that I was able to capture a moment like this and really wanted to document it. In terms of design the main inspiration for this page came from the floral stickers in the scrapbooking collection. They reminded me a little of a laurel wreath in the way that they curved so I decided to use the floral pieces to frame my cluster of three small photos. I printed the photos 4 up (4 small photos to a 4x6" piece) and in colour for this layout. I also added some stamping on this layout and used the 3 step floral stamp in the kit to add some further pops of pink to either side of the floral pieces on the page. To add further focus to the photo where my daughter is blowing on the dandelion seeds I added a small photo mat using the leftover paper from the background piece. The journaling was a nice quote I was able to find online - I thought it was appropriate and a nice 'life's lesson' page for my daughter. The wood veneer and enamel dots in the kit added those nice final touches to the layout. Be sure to leave a comment below by April 15th, 2018 at 11:59 PM EDT for a chance to win! 30 WINNERS will be chosen at random from the comments left on any of the blogs listed below and will be announced on the Altenew blog on April 17th, 2018. What an awesome creation! Perfect colors matching the pics! Your layout page is wonderful! WHat a stunning layout, I love the colours you used - it looks so fresh, and makes me long for spring even more (where I am, we still have snow, ugh). Thanks so much for sharing and inspiring! Very unique and pretty layout! Beautiful spring layout! Love the bright pink and greens. Beautiful layouts. Thanks for sharing with us and inspiring us. 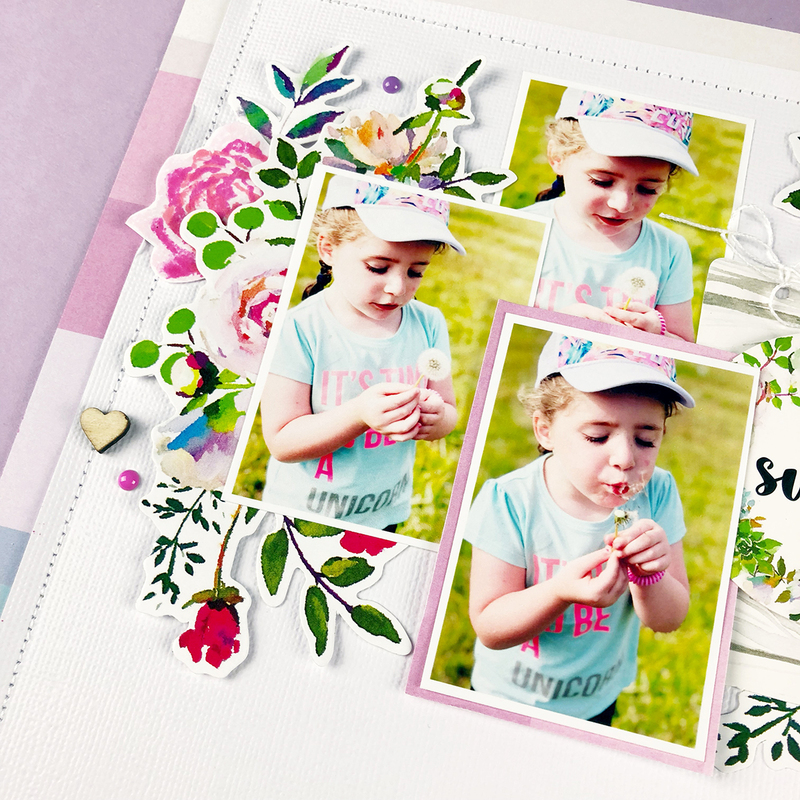 Such a pretty and sweet page, love the floral bouquet and the dandelion sentiment. Such a pretty layout. Thanks for sharing and for the inspiration. I love this page! Its so beautiful and you have a few pictures showing your little darling in action! Lovely!! Lovely colorful pages! Thanks for sharing! Your layout is so beautiful!! Love the flowers...so sweet! Beautiful page,love it! Altenew's scrapbook kits are so full of amazing embellishments for cards and pages. She is so sweet, great photos! Beautiful layout! I love your layout . Thank you for sharing it . Your pages are beautiful! I love the Altenew products and how you used them. Can't wait to make some pages of my own. Thanks for the inspiration! Gorgeous layout. I have one more scrapbook page to complete for my goddaughter and love this idea. Love the florals and color on white! Such a gorgeous layout! Thanks for sharing! Adorable layout. Love the colorful flowers. Beautiful! 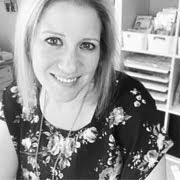 Love your layout, those adorable pictures and sweet sentiment. It all depends on your perspective. Thanks for the inspiration! Creative and beautiful. Thank you for sharing! I like your combination of stamp sets, letters, and embellishments. Your poem is a perfect compliment to the photo of the young girl with the ‘flower/weed’. So beautiful. Such an inspiration! I like the white space in your layout. Usually the pages are full and this really brings a focus! I love this layout of pure innocence! The scrapbook kit from Altenew works wonderfully with this photo. I like how you added the sticker pieces on the side. The quote is a winner, and one I may use in the future. Thanks for sharing the process on Altenew's Birthday hop. Awesome and very pretty layout! Love that sentiment. Beautiful layout! Love what you’ve made! Your layout is so pretty!!! Beautiful layout and I love the quote!! This is a beautiful scrapbook page! I, also, have pictures of my daughter blowing a dandelion and I haven’t put them in a page yet. Thanks for the inspiration! A sweet layout. Thanks for the instructional video too. This is so gorgeous!! I love the design!! The photos are beautiful!! Thanks for the amazing inspiration!! Beautiful layout! Love the colors and the flowers! The sentiment is so perfect for this lovely picture! Great job. Sweet layout. I love the journaling piece. Such a great sentiment that firs perfectly with the pictures. Really cute and a great memory. Thanks for sharing! This layout is oh so sweet! Thank you for sharing your process! Great job! :) Love the colors! I love how you kept the focus on your pictures of your sweet daughter and that the background didn't overpower it. Great use of the stickers and composition. What a great idea to cut out the center of the design paper --nobody would know and it seems such a waste because it's all covered up anyway. TFS! Such a cute and sweet layout 😍 Thank you for sharing!!! What a darling layout. Children are so precious and grow so fast. Have to scrap those special moments while you can. Beautiful layout. Thanks for sharing! love your white spaces, it makes the photo pop and your florals look simple and sweet. Love it! thanks for sharing. This is beautiful. 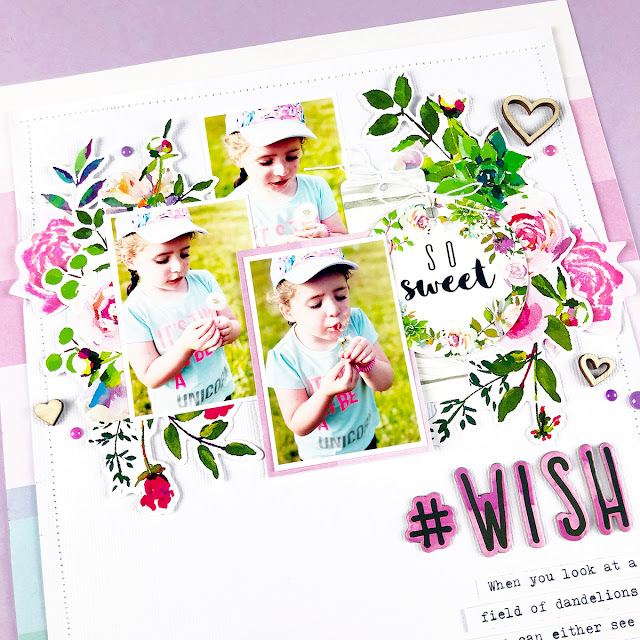 Though I mostly create cards, I love to see lovely page layouts! There's always something to inspire, whether it be color or a design idea! What a gorgeous layout, love all the flowers and the beautiful colors. Thanks for sharing with us. Your layout and little girl are lovely. What a cute layout! The colors are just beautiful. This is such a wonderful and pretty layout. Your daughter looks like she's having fun. I hope her wish came true. I love the quote and your floral elements are perfect for showcaseing your pictures. I love the layout, the colors are beautiful. Thanks for sharing. So soft and pretty. A lovely layout. Thanks for the inspiration! Love your beautiful layout! Thank you for sharing! Beautiful scrapbook page!! Love the flowers around the photos. What a beautiful layout ! Thank you for gorgeous floral arrangement and your little girl is so cute ! TFS. Love the new stamps and all the spring colors! Such a lovely layout! Wonderful showcase for those lovely pictures! Gorgeous layout! Beautiful combination of elements. I love how the elements draw your eye into the photos. Such a beautiful layout Raquel, great colours. Dandelions are just magical---unless you have more than your share of them in your yard! And you are thinking about selling your house. But how could you not capture that moment! Thanks so much. What a sweet page you have created. Loved it. Beautiful layouts!! Thanks for sharing! Beautiful layout. The design enhances the photos perfectly and the colors are so soft and pretty! The layout with your daughter is so beautiful. You caught her in the best pose and improved on it with the beautiful saying. Your layout is very lovely. 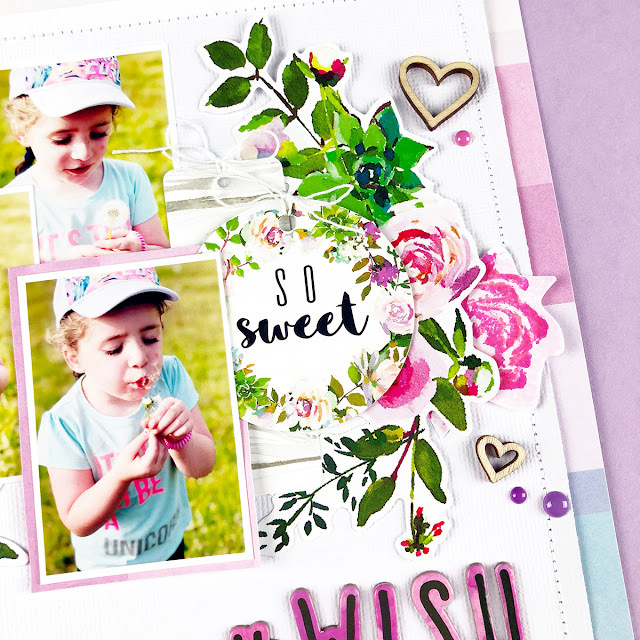 what a pretty layout for the pics of your sweet little girl! So sweet and pretty - love the flowers and colors. 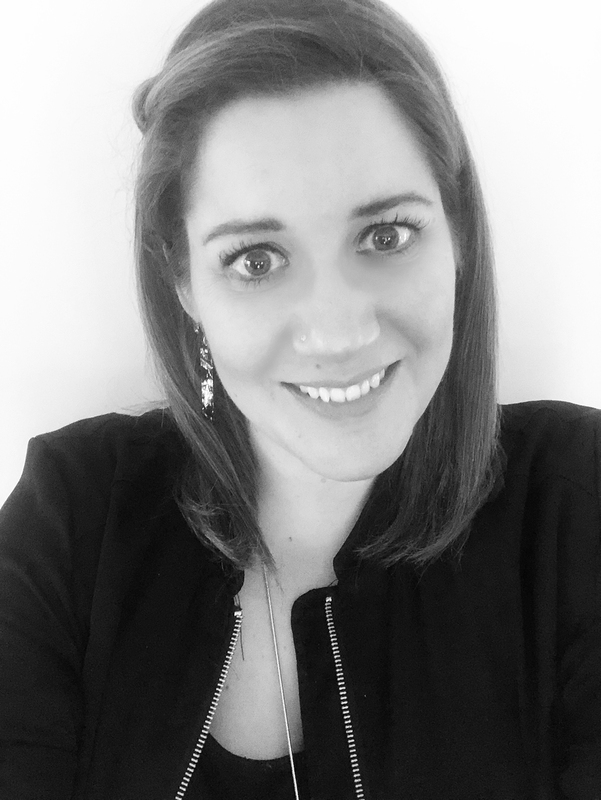 Raquel, your layout is simply perfection! I love that you decided to capture your daughter blowing on a dandelion and the page created displays the phots so beautifully! That curved floral spray is so gorgeous! And, best of all is that perfect poem you found. LOVE, LOVE, LOVE!! Beautiful layout. Love the details and color! Wonderful and sweet layout. TFS. Love your page and the quote you used! Lovely layout, and perfect for spring! Your layout is just ADORABLE! Lovely layout. Thank you for sharing your inspiration. What a beautiful layout to capture such a precious memory! Beautiful layout - thanks for the inspiration! Beautiful colors and details on your layout! Everything shows off the pictures so well! Beautiful layout and such pretty colors. Gorgeous layout, and I love that sentiment! So inspiring. I definitely need to switch my thinking to "wishes"! Gorgeous layout & inspiring sentiment! I love that. 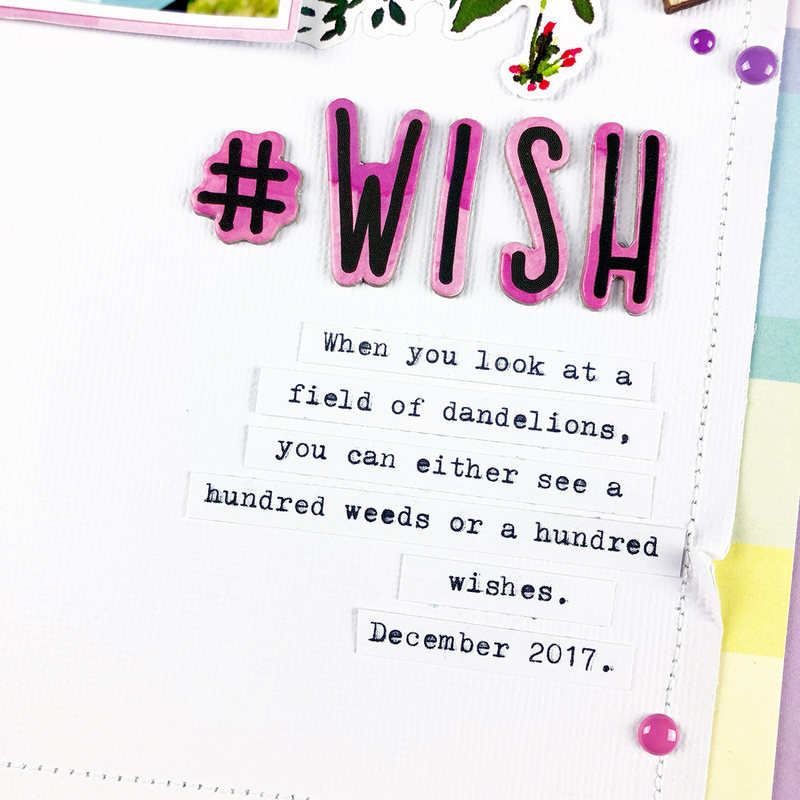 I need to change my thinking from "weeds" to "wishes"! Gorgeous layout! I remember blowing the dandelion fluff as a child! We call it Fairy 🧚‍♀️ 🧚‍♂️ Fluff in our house because when you blow it the fairies come out to collect it to make new Fairy wings and clothes! Thanks for the walk down memory lane with your sweet photos! 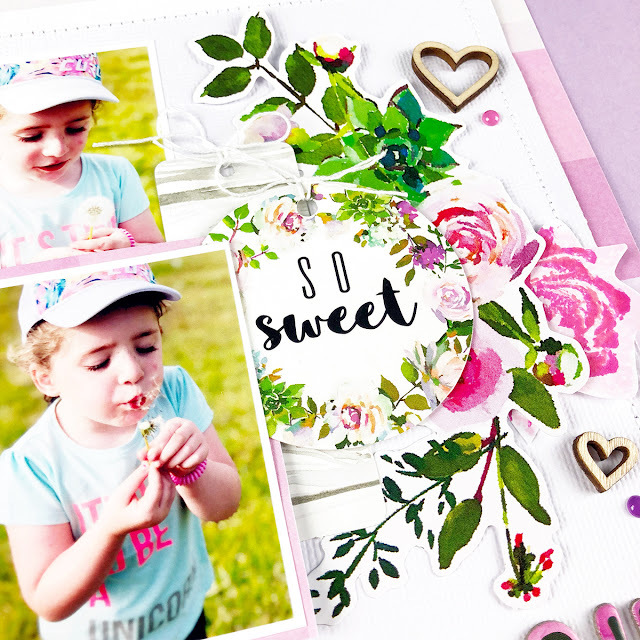 Raquel, this is a beautiful layout, I love the way the composition draws the eye to your beautiful little girl, the stamped flower arrangement and little wooden hearts make the perfect background for her photos, she’s darling! What a beautiful layout!! I love how you positioned your 3 pictures on the layout with the surrounding flowers!!! Your layout is so beautiful and so sweet. What a super layout!! It's so much fun to see kids discover things like dandelions isn't it!! What a wonderful quote. The colors you chose are beautiful. Thanks for sharing. What a cheerful and interesting layout! Great and fun hop! Lovely layout! As a scrapbooker I appreciate seeing layouts instead of just cards. This is a beautiful scrapbook page, with so many layers to add depth. Very nicely done. Thank you for sharing. What a great layout and I love the quote you used. You should frame this one and display it - its really lovely! 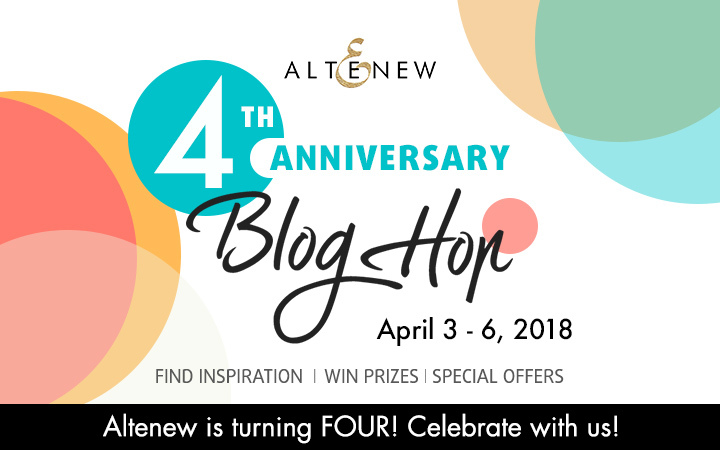 Thanks for participating on the blog hop today, and Happy Anniversary, Altenew! Very colorful layout, love it! Thank you for sharing. Beautiful layout, love how colorful it is. Thank you for sharing. Just gorgeous. A beautiful layout. What a beautiful layout. Great pictures of your daughter. Love your page! So sweet. Love how you framed the photos with the flowers. This is a beautiful layout. I got a little teary when I read the caption, it was so sweet. I need to get out my grandkids scrapbooks and make some pages. Thank you for inspiring me. Love the beautifully arranged flowers on your layout! Love all the layering on this pretty layout! Cute pictures and wonderful use of the stamps. Thank-you for sharing. Love your layouts and all the detail you put into it. Such a beautiful layout! I love the details. Such lovely colours. Amazing page. 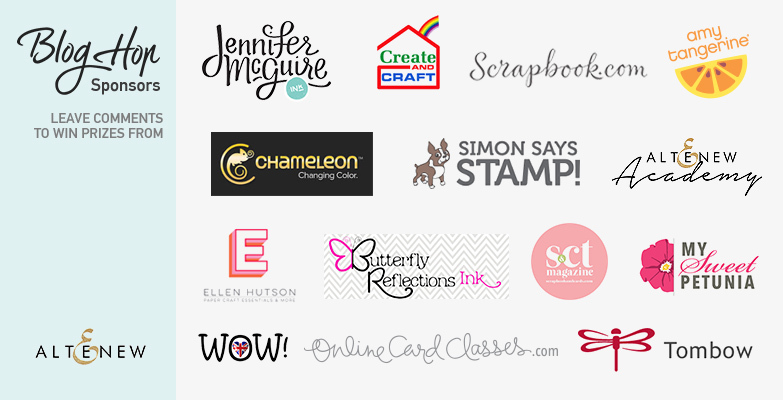 Love your design and the way you incorporate your Altenew stamps. Beautiful layout. Love your design. Oh, this is gorgeous1 Love the lovely flowers, the layers... such a happy and pretty design. Wow! Love the photos and the way you’ve scrapped them is gorgeous. Thank you for sharing your beautiful payout. Like the flowers around the pictures! Gorgeous inspiration, love the adorable picture paired with the caption 💖 thanks for sharing! Your LO is gorgeous! I love the way the garlands of flowers and leaves surround the sweet set of photos. The perfect frame for them. Lovely, there are so many elements to look at, love it. Such an adorable layout! That will be such a sweet memory down the road when she is grown. What a beautiful page is this! Love your way to present layout n flowers. I really like the page you made. How wonderful it is that you could get 3 pictures showing the steps she went through to blow on that dandelion. It’s pretty and it’s adorable! Thank you for sharing your work. Such a magical and whimsical layout "Wish"! Am loving it!! Wonderful page! Loving all the florals and colors! Sweet layout of these cute photos. Lovely layout. TFS! Happy 4th Altenew! Love the scrapbook layout! So sweet! Beautiful layout! I love the quote you added too. Gorgeous layout ... so colourful and vibrant. This is a beautiful layout. I haven't scrapped booked in awhile but this layout gives me inspiration and a desire to create a page. Thanks for sharing. Beautiful layout! I love the colour match to the pictures and what spectacular pictures!